Clicky won't log heatmap data until you tell us about site's width and alignment. 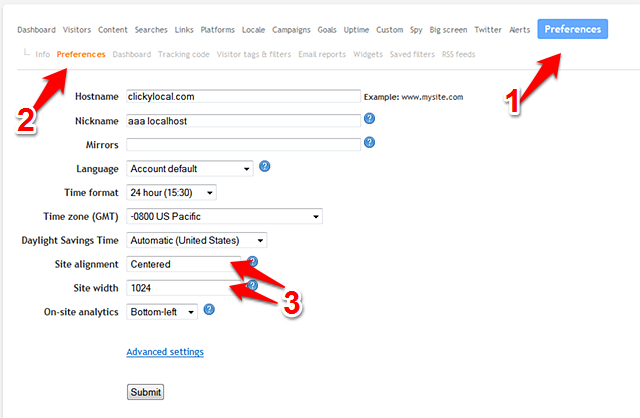 You can do this in your site preferences, as shown below. If you have no idea what values to use, centered with a width of 1200 is a safe bet. The width does not have to match exactly what your site is. Just choose the lowest number that encapsulates the entire width of your site. RESPONSIVE SITE? Most responsive sites have a "max width", typically somewhere between 1200 and 1600, and will be centered when the max width is applicable. We recommend choosing "centered" and the max width value. Why? We don't log heatmap data for mobile visitors and most desktop visitors have high resolution screens so will be viewing your site at max width. So this setting will give you the most accurate data. Note: Heatmaps require a Pro Plus or higher account (or the trial account), so upgrade if necessary.